Antarctic ice sheet models double the sea-level rise expected this century if global emissions of heat-trapping pollution remain high, according to a new study led by Dr. Robert Kopp of Rutgers University and co-authored by scientists at Climate Central. Global average sea level is expected to rise by one foot between 2000 and 2050 and by several more feet by the end of the century under a high-pollution scenario because of the effects of climate change, according to the projections in the new peer-reviewed study. It shows 21st century sea-level rise could be kept to less than two feet if greenhouse gas emissions are aggressively and immediately reduced, reflecting a larger gap in sea-level consequences between high and low emissions scenarios than previous research has indicated. High-pollution projection for Norfolk and Portsmouth, Virginia in 2100. See interactive map here. The study provides a median projection for sea-level rise of 146 cm (4’9”) during the 21st century under a high-pollution scenario known as RCP8.5 (see Table 1), when results from new modeling of Antarctic ice sheet behavior are included. The Intergovernmental Panel on Climate Change’s most recent report, published in 2014, which assumed the Antarctic ice sheet would remain stable, provided a median projection for the same scenario during a similar time period of 74 cm (2’5”). Previous efforts to project future sea levels have combined projections for future levels of greenhouse gas pollution with findings from research into the effects of that pollution in warming oceans and melting glaciers. Those efforts have either excluded the possibility of ice sheet break-ups on the margins of Greenland and Antarctica, left out the consequential new mechanism of marine ice-cliff instability, or relied on experts’ opinions regarding these potential impacts. Ice loss in Antarctica could do more to raise sea levels than all of the other factors combined, and recent ice sheet modeling developed by Robert DeConto of University of Massachusetts and David Pollard of Pennsylvania State University has indicated the continent’s ice reserves may be less stable than previously thought. The new study, “Evolving understanding of Antarctic ice-sheet physics and ambiguity in probabilistic sea-level projections,” combined the results of the modeling by DeConto and Pollard with sea-level rise projections published in 2014 and since employed by multiple cities, states and federal agencies. The new study, led by Kopp, was published Dec. 13 in the journal Earth’s Future. Other scientists involved with the research are affiliated with Columbia University, Harvard University, Princeton University, Boston College and Climate Central. The study projects a range of potential levels of sea rise under different greenhouse gas emissions scenarios. Even the lowest levels of projected sea-level rise would require heavy investments in adaptation efforts and could require residents and businesses to relocate. Greater levels of sea-level rise increase economic and social impacts. The median projection for sea-level rise from 2000 to 2050 in the study was roughly 30 cm (one foot) under RCP8.5. The research indicated that sea levels in 2050 will be affected little by the amount of greenhouse gas pollution that’s released during the coming years. The new projections warn of runaway risks during the second half of the century, with those risks substantially higher if current levels of greenhouse gas emissions continue. 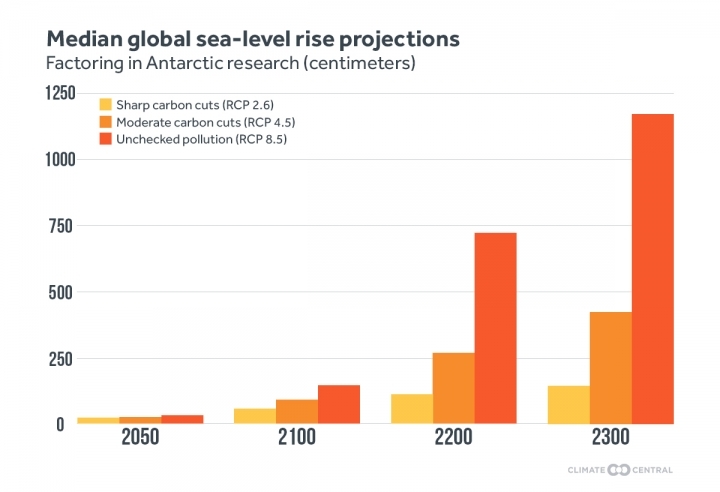 Under the high-pollution RCP8.5 scenario, the study’s median projection for the period 2000 to 2100 is for 146 cm (4’9”) of global average sea-level rise. According to the research, local rise would vary from region to region under the same scenario, and would exceed the global average for all U.S. Gulf and Atlantic coast locations, ranging up to 225 cm (7’5”) or more in Louisiana. Two of the authors of the paper were Climate Central’s Benjamin Strauss and Scott Kulp. 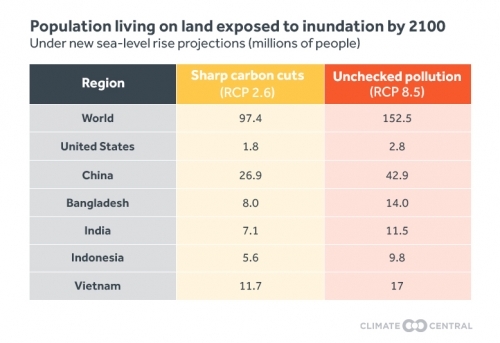 For the study, the pair mapped local sea level rise projections worldwide, and calculated that, unless new protections are built, water could permanently inundate land currently home to 153 million people (see Table 2). For perspective, that is nearly half of the U.S. population, and more than three times the estimated number of refugees worldwide at the end of 2016. This assessment used available global elevation data from NASA. As these elevation data are known to significantly underestimate coastal exposure to sea-level rise, the affected population could be substantially larger. 90 percent of the study’s simulations found that global sea-level rise will be between 93 cm (3’1”) and 243 cm (8’) during the 21st century under RCP8.5. Under the high-end 8-foot scenario, impacts would be particularly heavy in the continental U.S., where sea level would rise substantially more than the global average. Due to regional effects driven mainly by land subsidence and gravitational effects linked to ice mass loss from Antarctica, sea-level rise of 9 to 11 feet would be expected along densely populated Gulf and Atlantic coasts. Under an alternative scenario, known as RCP2.6, in which emissions are aggressively and immediately reduced, the study projects a median sea-level rise of 56 cm (1’10”) during the 21st century. The research cannot yet assign likelihoods to different sea-level outcomes, but it explores a wide range of possibilities, making the median (central) values relatively robust. The study represents an important early step at integrating Antarctic physics into sea-level projections. For a further perspective, read Kopp's blog at the Climate Impact Lab.